Isabella Goes to the O.R. The weekend of November 15-16 started off like every other weekend. We all slept in a little later (me even later than the rest). The kids were up watching cartoons as Julianne made them breakfast. When I came downstairs, though, Julianne asked me to look at something peculiar. She asked Isabella to take a sip of water from a cup, and she did so, but with her left hand. We then asked her to take a sip with her right hand and she did, but this time, her right hand trembled a little as she took a sip. Julianne also pointed out that Isabella was coloring and writing with her left hand. Odd, we thought, because she was always a righty, and even stranger was that her handwriting was actually pretty good with her left hand. We made note of it and scheduled an appointment with the pediatrician for Monday morning. We would also talk with Isabella's teacher to see if she noticed anything. The rest of the weekend was typical, with running errands and working around the yard. I had stayed home with Annalise to rake the leaves while Isabella and Nathaniel ran errands with Julianne. As a reward for being good all weekend, we took the kids to "My Three Sons" which is a children's playplace here in Norwalk. Isabella ran around and showed no signs of anything wrong, except for favoring her left hand. 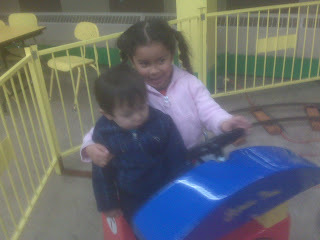 In the picture above, she's riding a toy train and holding her brother to make sure he doesn't fall. We left relatively early after Annalise and Isabella picked out their prizes. They both had school the next day and had to take a bath and I had to get ready for work. Little did we know that the tumor that was growing inside Isabella's head was about to cause much more damage over the next 24 hours.